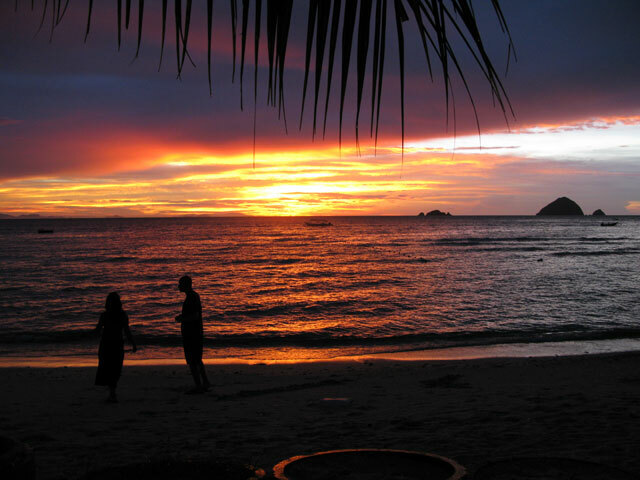 Pulau Perhentian is located in the South China Sea 21 kilometers from the coast of Kuala Besut, Terengganu. For hundred of years ago vessel sailing from the south coast of Peninsular Malaysia to Bangkok will stop-by for a rest and shelter at the island. They all are ancient merchants carrying food, jewelry, vast and etc. As the activities of merchants, sailors and traders from the South of Chinese Sea have taken place, the island is getting popular for their "one stop station", these islands were named as "Once Stop Island" so called "Pulau Perhentian" in Malay language. It comprises of two islands; Pulau Perhentian Besar and Pulau Perhentian Kecil. Both islands are surrounded by beautiful palm-fringed powdery white sandy beaches and crystal-clear turquoise-blue sea. The two main islands are heavily forested and ringed with sandy beaches, typical of tropical islands. 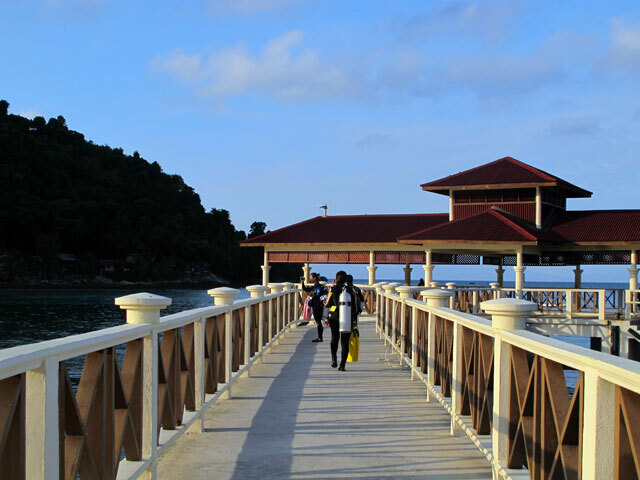 Accommodations for visitors are predominantly aimed at budget travelers and are mostly on the larger Pulau Perhentian Besar, which not only has wonderful beaches but also forest trails over the hills. All manner of aquatic life is visible both near and far from the beach such as turtles, sharks, coral and thousands of tropical fish. The interior is covered by jungle with a wide variety of species. You can watch monitor lizards, monkeys, geckos, flying squirrels, butterflies and many other types - sometimes right in front of your chalet. There are no roads and not many paths, so the islands are mainly peaceful and untouched - so far. In Kelantan & Terengganu states, offices are closed on Friday & Saturday. Their normal work week is from Sunday to Thursday. 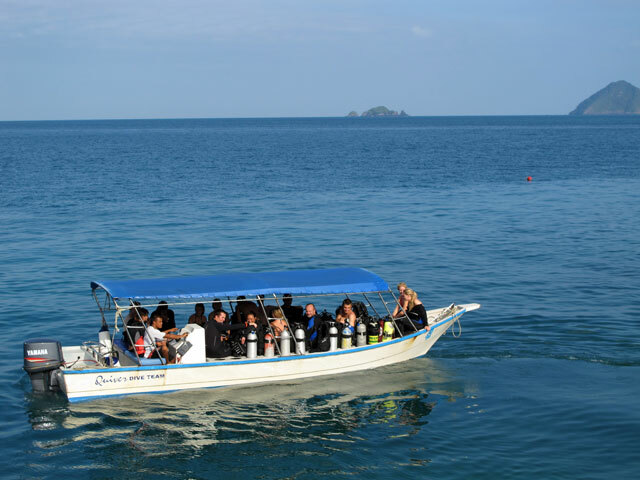 To get to Perhentian Islands, travel to Kuala Besut where boats await to take passengers to the islands. Kuala Besut is accessible via express coaches from major cities in Malaysia. Alternatively, fly to Kota Bharu or Kuala Terengganu (the main airports on the east coast), and hire a taxi to travel to Kuala Besut, which is around 45 to 60 minutes by car. At Kuala Besut, tourists have to pay a Marine Park conservation fee of about RM5.00 adult & RM2.50/child. Boat services at Kuala Besut are available for a fee of about RM70 return trip. There is no fixed boat schedule; they depart when there are enough passengers. 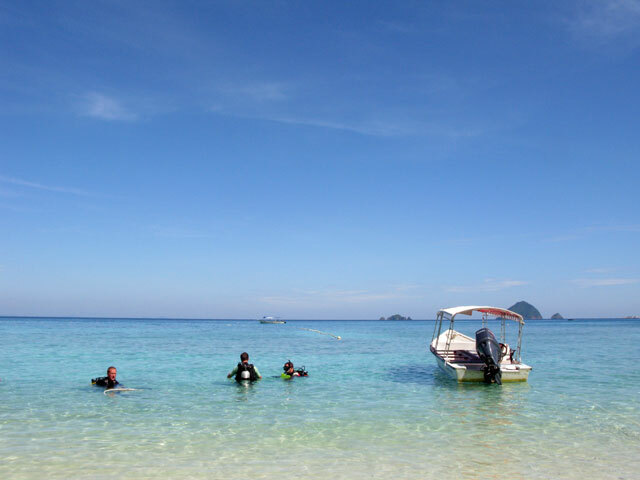 The best time to come to Perhentian Islands is between March and October when the weather is sunny and warm. Peak season is in June, July and August, so expect to pay slightly higher prices in accommodation. The islands are closed usually between November and February due to the monsoon season which brings rain and makes boat travel to the island difficult. Electricity - All resorts use their own generators, so some resorts/chalets provide 24 hours electricity and others, only 12 hours electricity.